What more perfect place to read this wonderful outing for Inspector Montalbano than under the Sicilian sun? I could not quite manage that, but reading this book in the hills above Sorrento in southern Italy did not do my mood any harm. 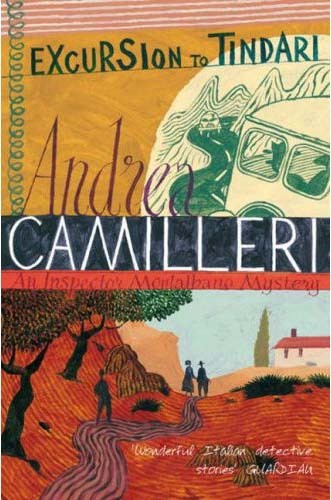 Camilleri follows up his earlier books about the Vigata police with an equally assured and vivid account of two crimes. One is the murder of a young man, and the other concerns the disappearance of an elderly couple while on a trip to the titular historical site of Tindari. The connection is that the young man and the old couple all live in the same apartment building. Montalbano investigates these crimes with his customary blend of detection and intuition, ably assisted by his wonderfully portrayed team. Each member would not make much of a stab at police work if left to his (they are all male) own devices: one colleague is too susceptible to the female form, another is barely literate apart from when it comes to computers, a third has little imagination. Yet when combined, the team works perfectly to follow up every lead. EXCURSION TO TINDARI is an utterly convincing slice of Sicilian life: you can smell the sea and the fish; enjoy the wonderful meals in the restaurants; and smile at Motalbano's deft handling of the politics of the higher police echelons as well as of the Mafia. Yet the book is far from whimsical: it is written with great discipline and without any unnecessary prose. It slips down so smoothly that it is finished before you realise it, leaving you both satisfied and slightly melancholy to have finished the book. The detective aspects of EXCURSION TO TINDARI are a slight stretch. Nene Sanfillipo, the young man who is killed, remains an enigma for slightly too long for the seasoned crime reader. The discovery of certain books and videos should have rung the correct alarm bell a bit quicker. And the excursion to Tindari taken by the old couple turns out to be a bit convoluted – villains are, I imagine, a bit more simple-minded in real life. But never mind, the book is just wonderful for its superb evocation of a way of life, its barbed cynicism about the prevailing political and social culture, and above all its sense of moral values. Events may not always end happily, but the decent thing is done, and that's enough for Montalbano and his trusty colleagues. Read another review of EXCURSION TO TINDARI.